A Song Called 'Quiet' Struck A Chord With Women. Two Years Later, It's Still Ringing Born as a vessel for one person's trauma, the song by MILCK became an anthem overnight after the 2017 Women's March. But it wasn't done growing. Hundreds of singers joined MILCK and the Canadian choral group Choir! Choir! Choir! to perform "Quiet" at Toronto's Phoenix Concert Theatre in early 2017. Two years ago this week on the National Mall, amid a sea of pink hats, a piece of music suddenly went from speaking for one to speaking for many. Months before the fall of Harvey Weinstein catapulted the #MeToo movement into the mainstream, a song called "Quiet" caught fire overnight, becoming a global anthem for victims of sexual harassment and abuse — almost as though women were waiting the words to help them share their collective rage: "I can't keep quiet for anyone anymore." Connie Lim, who performs as MILCK, originally co-wrote "Quiet" in 2015. She says she always viewed it as her "personal therapy song," to help her cope with having been sexually assaulted and abused when she was a teenager. Then came the 2016 presidential election. "The rhetoric that was used to describe women really enraged me, and just kind of brought me back to those feelings of when I was younger," Lim says. "I was told I needed to 'sit properly,' and I need to 'speak less' and 'smile more' and 'lose weight' and just be this perfect little girl." 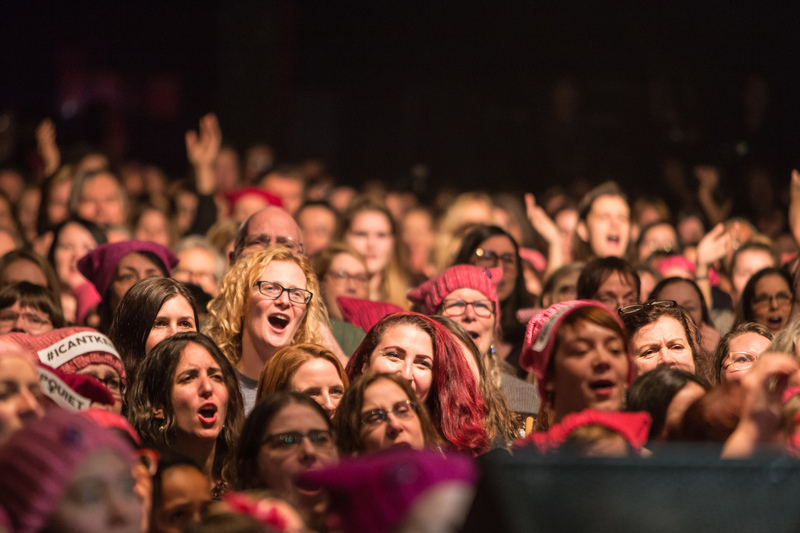 Compelled to share "Quiet" with the world, she channeled her rage into an idea: Teach the song to other singers and perform it at the Women's March in Washington, D.C., the day after President Trump's inauguration. Lim lives in Los Angeles, so about a month before the march she put out a call to female a cappella singers in D.C. Two groups responded: Capital Blend, a professional ensemble, and the GW Sirens, a college group. After lots of emailing and Skyping to learn the song and some-in person rehearsing the day before, they put on their winter coats and pink hats and headed to the march. "We had no idea how crowded it was going to be," Lim says, laughing. An estimated 470,000 people flooded the National Mall and the areas around it. Dozens of artists and activists spoke, including Gloria Steinem, who told the crowd there were people marching in streets all over the world, "in every state in this country and on six continents." MILCK and her 26 singers were not well-known enough to be on the main stage. Instead, they squeezed their way through the crowd, finding different spots to sing "Quiet" for anyone who would listen. Tessa O'Rourke, a soprano with the Sirens, says she's never experienced anything like it: Not only did people listen, they were mesmerized. "Every time we sang we saw people watching, and there would be people looking right at us, crying," she recalls. "And then we would look at each other and start crying. It was all just so emotionally charged." Filmmaker Alma Ha'rel was one of those who teared up. She was trying to make her way through the crowd when she stumbled upon the singers. They can feel completely immersed as a collective. But they also can feel like an individual at the same time. "This was one of those moments that I think everybody around just felt, something extraordinary is happening," she says. "MILCK really gave a voice to a lot of women with that song." That night, Ha'rel shared her video on social media. Within two days, it had some 8 million views. It was shared on Twitter by Emma Watson, Debra Messing and Rage Against the Machine's Tom Morello, among others. The singers were invited to perform on Full Frontal with Samantha Bee, who called it "a protest anthem for the ages." Lim says she was inundated with requests for the sheet music, which she posted online. Soon people around the world were recording their own versions of "Quiet." In Sweden, hundreds of women and men gave it the flash mob treatment at Stockholm Central Station. In Austin, Texas, The Austonettes sanctified it. Daveed Goldman, co-founder of the Canadian group Choir! Choir! Choir!, says they had no trouble attracting 1,300 singers to perform with MILCK at a theater in Toronto. He says most of the group's members are women, many of whom had seen Alma Ha'rel's video from the Women's March online. "People were definitely excited. It didn't take a long time to fill that room, that's for sure," says Goldman. "People brought their kids. It was really beautiful." In a video from Ghana, a group of women face each other as they sing "Quiet" like it's the release they've needed for years. Activist Love Nyaaba says it was a thrill to find a song with the words "I can't keep quiet," especially in northern Ghana where, she says, women do not have the same political or economic opportunities that men do. "For the most part we are told to 'keep quiet and make it work,' " she says. She and her fellow activists even translated "Quiet" into the local language, Dagbani. As for Connie Lim, she says it was "a deeply spiritual experience" to have contributed something that turned out to have value for thousands of people around the world. She believes the fact that so many groups have made the song their own shows the power people feel when they sing together. "They can feel completely immersed as a collective. But they also can feel like an individual at the same time," she says. "And there's space for this cathartic release." Daoud Tyler-Ameen contributed to the digital version of this story.